John C. Hutt, Jr. & Associates is located in Montross, Virginia, in the legal building adjacent to the U.S. Postal Service on Kings Highway (VA Route 3). Address and directions are below. 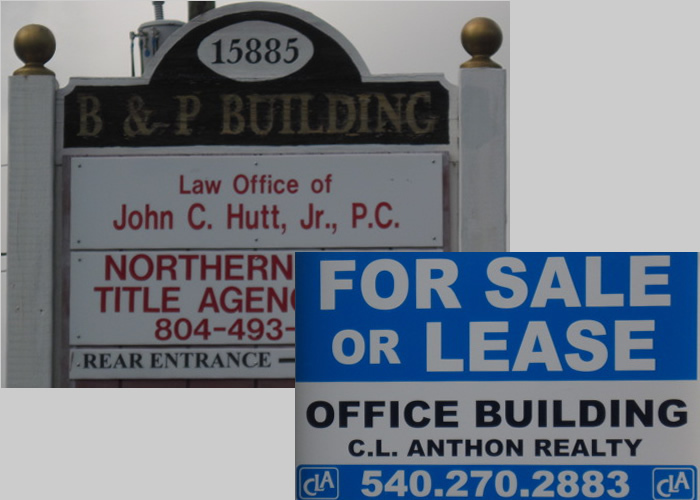 The John Hutt Law firm desires to Sell or Lease its current building at 15885 Kings Highway, Montross, VA. For detailed information contact C.L. Anthon Realty (540) 270-2883 or address queries to John C. Hutt at (804) 493-9700. See Office and Building Photos. John C. Hutt, Jr. P.C.